I recently connected with Matt via #RunChat one Sunday on Twitter. After discovering his blog, I wanted to contribute to his community, and help introduce his audience to my favorite aspect of running. I’m talking about Charity Miles, a group I represent as an All Star. It’s an honor to call myself an All Star, and I’d like to share my experience with you. As a runner, there are days I struggle to lace up and get out the door. It’s hot, it’s cold, I’m tired, my legs are still sore from yesterday… Since April though, I’ve had endless motivation to keep my feet moving. Every day as I step out to run, I choose a charity to donate to, and think about how they will benefit from my miles. I push myself farther to see how much I can give. 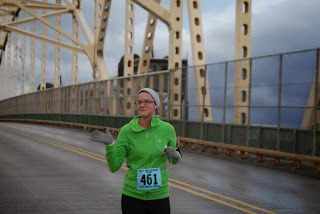 Charity Miles has made me a better long distance runner by adding to my motivation and drive. So what’s it all about? It’s not all about me, that’s for sure, though it’s given me new running perspective. It’s about the charities that benefit from runs, bike rides, and walks. On the most basic level, each mile earns 25 cents for a run or walk, and ten cents for a bike ride. On a greater level though, charities and runners are able to connect on a global level for causes that impact us all. Charity Miles currently boasts 25 charity partners, ranging from Habitat for Humanity, to Stand Up 2 Cancer, to ASPCA, to the Special Olympics. It all sounds great doesn’t it? That’s because it is! It’s easy, it’s free to the athlete, there’s variety, and there’s no end in sight. To get involved, simply download the free Charity Miles app and create an account. When you open the app for the first time, you’ll see that you can scroll through the available charities and select one. That charity will benefit from one run when you hit start (and obviously finish later on). The next time you log in, you can select either the same charity, or a different one. Nothing locks you to donating exclusively to one charity. I have about six or so that are dear to my heart that I cycle through. Now, as a very aggressive runner in terms of my data (pace, distance etc. ), I do need to mention that there is not a data log in Charity Miles that meets my needs. It keeps a history of my donations, but that’s really it. I still use another tracking app for stats. I find that using two apps while running does not deplete my phone if I keep my screen off – just a hint for best battery use on your phone. The other catch, that I hope you’ve caught, is that this is a GPS based system. Runs must be logged in real time through the Charity Miles app. Since I run with my phone (safety freak over here) it’s not a big deal to me. Sorry to Garmin users or free runners - you can’t manually log miles. Earlier, you may have noted I wrote donations are 25 cents per mile for running and walking, and ten cents for biking. This sounds tiny in the small scale of a single activity. Remember though, we’re logging huge numbers combining every individual run, walk or bike ride of all users. Through Charity Miles, I have donated about $200 in the six months or so I’ve been using the app. I challenge you to beat me – in a good natured “this is for charity” kind of way. Our motto with Charity Miles is #EveryMileMatters. Live that and remember with each step you are donating to something important. It gets me out the door. It gives my runs meaning. It’s pushed me to run more often, and farther on each run. Follow me on Twitter at @RunCraftier to see my donations five days a week or talk with me about running. Follow Charity Miles at @CharityMiles for blog posts and updates. And lastly, if you want more information directly from the source, find more at www.charitymiles.org. Best wishes, happy donating, and happy running!